Here’s a little post of a new favourite breakfast recipe I’ve been making a lot these days. Usually I eat pink grapefruits for breakfast by slicing them in half, loosening the segments with a knife, sprinkling lots of sugar over and eating with a spoon. Delicious but not so nutritious with all that sugar. This version is somewhat healthier, (if like me you ate way too much cheese over Christmas), and also serves as a second alarm clock with the ginger, grapefruit, mint and passion fruit combo giving you a big slap around the face. Start with the chia seeds in a bowl. Segment the grapefruit holding it over the bowl of chia seeds so that you catch all the juices, (this youtube video shows you exactly how it’s done). Add the milk, desiccated coconut, honey and ginger, mix well together and set aside to soak for at least 30 minutes or overnight if you’re not a morning person. When you’re ready to eat, cut the passion fruit in half and scoop out the seeds and pulp, add some fresh mint and that is it! Give it a try, it’s perfect for an on-the-go breakfast, you can make it in advance and take it to work in a flask or plastic container. It makes a lovely change from porridge and is much more filling than a juice or smoothie. Add your own favourite flavours if you’re not a fan of pink grapefruit and ginger. try mashing a banana into it or some raspberries, replace the grapefruit juice with orange juice, whatever takes your fancy! 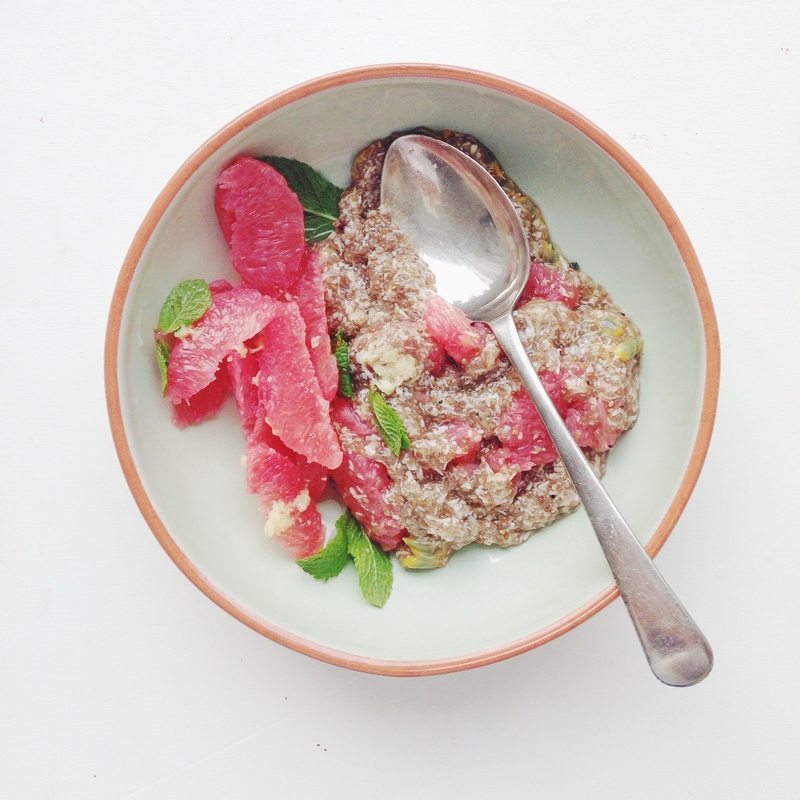 This entry was posted in Food Styling, Personal, Recipes and tagged Chia Breakfast, Chia Pink Grapefruit Breakfast, Chia Recipe, Chia Seed Pudding, Food Styling, food stylist, Healthy Breakfast Recipe, Healthy Eating. Bookmark the permalink. 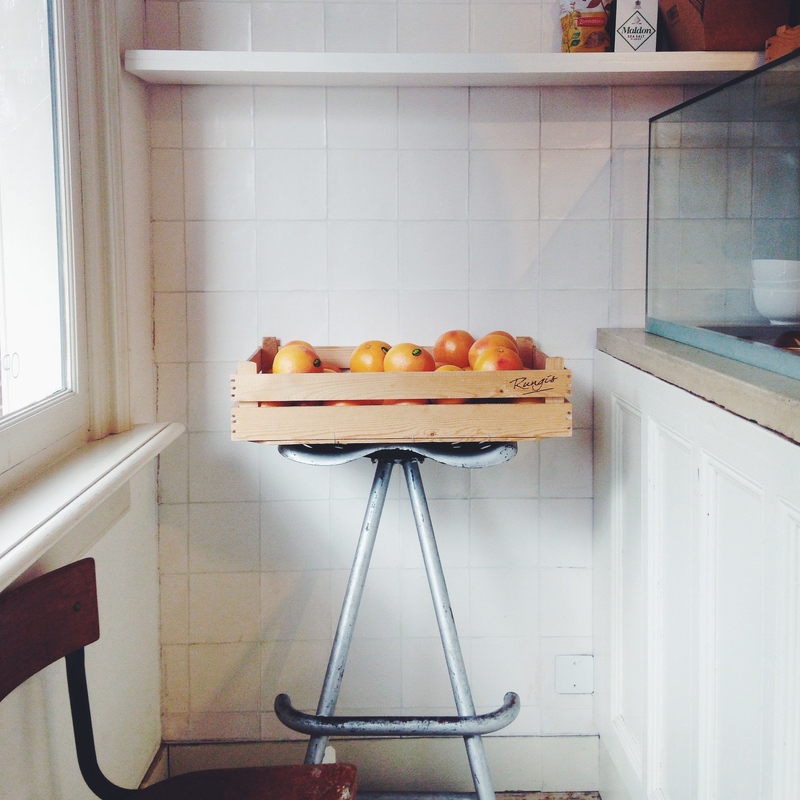 I love your little space and stool!